He was all of 34 years of age when he finally made his Test debut, yet by 2015 there are still only ten Australians who have exceeded Clarrie Grimmett’s haul of 216 Test wickets. None of the ten men above him can better his 5.83 wickets per match. In fact only Dennis Lillee gets above five, and then only just. Perhaps the more remarkable is that Grimmett did not begin his Sheffield Shield career until he was 32, yet to this day no bowler has been able to overhaul his total of 513 wickets. In fact only four men have got past 400, Michael Kasprowicz with 441 being a distant second. There were two major reasons for the delayed take off to Grimmett’s career. He missed several seasons due to the Great War, although that may not have made a great deal of difference. The most significant factor was the simple one that he was not Australian. Grimmett was born in Dunedin on Christmas Day of 1891, and did not move to Australia until the end of the War. He made his First Class debut in the land of his birth in February 1912, and his early games there, including two against a strong Australian side in February 1914, whilst bringing him reasonable rewards, did not suggest he was a great bowler in the making. By the time that Grimmett played against Australia, and had the opportunity to bowl just a single over at his boyhood hero, Victor Trumper, he had already decided to make his home on the other side of the Tasman Sea and a few weeks later arrived in Sydney with his mother and sister. His father remained in New Zealand, for reasons that are not clear. Grimmett Snr died years later, almost a recluse, having changed his name in order to spare his by then successful son any embarrassment. Grimmett’s trade in those days was as a signwriter, and he used his skills with brushes and drawing materials throughout his life, latterly mainly for pleasure. It is a curious coincidence that the previous incumbent of the title of Australia’s leading wrist spinner, Arthur Mailey, was also a gifted artist, albeit one better known for his cartoons and caricatures than the more traditional painting that was Grimmett’s metier. Mailey had been one of the Australian tourists who had visited New Zealand in 1914. The young Grimmett had sought his advice and felt snubbed by the response he received so the pair were never close. When they did play together for Australia briefly in the mid 1920s Grimmett proved beyond any doubt that he was the better bowler. Beyond the nature of their art Mailey and Grimmett had little in common. Mailey was never renowned for his accuracy, and constantly risked length and direction by seeking extravagant turn. When facing him batsmen had to take great care to avoid groping in no man’s land and being made to look foolish, but at least had the consolation, if they could survive that, of a steady supply of cannon fodder. There was no such concession from Grimmett however, and batsmen never got an opportunity to relax. As the great Australian writer Ray Robinson famously said Mailey bowls leg spin like a millionaire, Grimmett like a miser. Ashley Mallett gave his biography of Grimmett the sub-title The Bradman of Spin, and in terms of their single-minded dedication to their calling it was an entirely appropriate comparison. By the end of the Great War Grimmett was established in Sydney, but saw that he was always going to have to compete with Mailey if he had ambitions to play for New South Wales, so he moved to Melbourne where there was no similar obstacle to his progress toward the ambition that he still held to play Test cricket, notwithstanding that his thirtieth birthday was fast approaching. The home that the family moved into in Melbourne had a garden of sufficient size to permit the incorporation of a full size turf pitch on which Grimmett could hone his skills. One of the most endearing stories in the game is that of Joe, a small black and white fox terrier that assisted Grimmett’s efforts. Joe was trained to lie a few feet from the stumps at the batsman’s end, and to watch each of eight deliveries sent down by his master. That final ball was Joe’s cue to dash into action, returning each of the balls to Grimmett’s feet as quickly as he could, before the cycle resumed and, most evenings, continued until dusk brought a natural conclusion to the session. An eccentric looking bowler Grimmett always bowled in a cap. Between deliveries and overs there was a calisthenic routine to keep his fingers in peak conditions for the subtle variations that he would test the batsmen with. The stock delivery was a leg break. There was also the occasional googly, and most lethal of all a top-spinner. In due course, and not without many hours of practice, came the flipper. As to his action Grimmett came in off around six paces and his arm was so low at delivery that he was almost round arm. 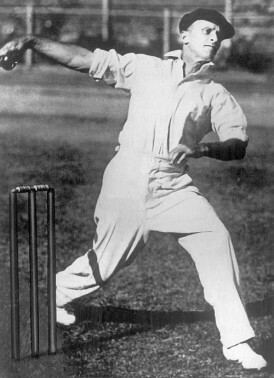 The effect was exaggerated by the way that his front leg seemed to partially collapse as Grimmett released the ball. Mallett summed it up rather nicely; his action was the sort often seen on the sands at a beach when an elderly gentleman bowled to his grandson. As noted there was no great turn of either the leg break or the googly, and the latter was not difficult to pick. The top spinner and flipper were trickier for the batsman to spot, but all but impossible to detect were the subtle changes of pace. The arm speed never changed, just the point at which the ball was released, and then only fractionally, but enough to do the damage. Bradman told Mallett that his control was remarkable. There is some footage of Grimmett to be found, and it is well worth having a look at. Despite there being no Mailey in his way Grimmett found it no easier to get into the Victoria side than he had the New South Wales one. There was the odd appearance at First Class level, but he did not make his Sheffield Shield debut until the final game of the 1923/24 season, a game which was a comfortable enough innings victory over South Australia at the Adelaide Oval. Grimmett got just three overs at the fag end of a poor first innings performance, in which he took a single wicket. The visitors made a rather better fist of things when following on, and without Grimmett’s 8-86 the outcome of the match might have been rather different. The South Australians were not a strong side at this point, and having seen at first hand what Grimmett could do made him an offer. Unsurprisingly he chose to leave Victoria, and by the end of the following season Grimmett had shown the cricket world exactly what he could do, and in particular had enjoyed a dream debut in Test cricket. He couldn’t stop Victoria twice defeating his new team, but 14 wickets against them made sure he was noted and, with Australia 3-1 up in the Ashes series that season he was brought into the side for the fifth Test to play alongside Mailey. “Horseshoe” Collins won the toss and batted and despite their difficulties earlier in the series England did well to dismiss Australia for 295. Grimmett batted at number eleven, below Mailey which doubtless irritated him, but he remained unbeaten on 12 and that settled his nerves. In truth he wasn’t a bad bat at all, and passed fifty on a dozen occasions during his career, the last of them in his final First Class innings, by which time he was nearly fifty. Grimmett’s great friend “Tiger” O’Reilly confirmed Grimmett’s belief in his batting ability when he wrote in his autobiography; He so fancied himself as a batsman that whenever I appeared at the crease with him he always assumed the fatherly role of farming the strike away from me. When England replied they lost two quick wickets, Jack Hobbs to Jack Gregory and Andrew Sandham run out as a result of a Grimmett return. His confidence further boosted by that piece of skill he bowled well after coming on a little late as third change and his 5-45 helped hustle England out for 167. Mailey’s figures were 0-13, from five overs, showing unusual restraint. Perhaps he was feeling the strain of the competition. In Australia’s second innings both Mailey and Grimmett were bowled by Maurice Tate without troubling the scorers, but it hardly mattered,as by then Australia were 453 in front. England never looked the part in their second innings and were all out for 146, Grimmett 6-37. Mailey did not get so much as an over, Collins preferring to partner Grimmett with his own occasional orthodox slow left arm. Grimmett was selected for the party that went to England to defend the Ashes in 1926. He began as back up to Mailey and did not make the side for the first two Tests. An injury to Collins opened up a place for him in the third Test however and his seven wickets, including 5-88 in the England first innings meant that he remained in the side for the rest of the series, won by England with a dramatic victory in the final Test after four draws. Mailey finally got some wickets in that last match, but his return of 14 wickets at 42 from five matches was inferior to Grimmett’s 13 at 31 from three. On the tour as a whole Grimmett took 105 wickets at 17, as against Mailey’s 126 at 19. As an indication of the thankless task that by now faced quicker bowlers in Australia their next two most successful bowlers on the tour were two more spinners, Charles Macartney and Arthur Richardson who both took 49 wickets, at 17 and 19, with their orthodox slow left arm and off breaks respectively. Test matches in Australia in Grimmett’s time were played to a finish. Sheffield Shield matches were as well until 1926/27, after which they were played over four full days with an additional long morning session on the fifth day. Wickets were, unless rain intervened, perfect for batting on and a recipe for long toil for bowlers. There were two scores, still the only two, of over 1,000, and totals of 600 plus were not unusual and then, in December 1927, Don Bradman appeared. His debut was against Grimmett’s South Australia, and in the first innings he became the twentieth Australian to score a century on debut. In the second innings however Grimmett, in the course of taking 8-57, bowled him off his pads. Theirs was to become an enduring rivalry. Twenty five times they clashed, and Grimmett dismissed “The Don” ten times, a record he shares with Hedley Verity. In 1928/29 England, with an immensely strong batting line, up won the Ashes 4-1. At first glance Grimmett’s performance looks unimpressive as he averaged 44.52, but that needs to be looked at in context. As a team England scored 3,757 runs over the course of the series, and Grimmett did take 23 wickets. Of those runs Hammond scored 905, and he wrote later of Grimmett Of all the bowlers I have met he was the one I could take least liberties with. By 1930 the talent of Bradman had fully flowered and, as he demolished Hammond’s record, the Ashes were regained. For all his genius however Bradman could not win the series alone, and there were 29 wickets for Grimmett, a haul that remained a record for an Australian in a five Test series in England until Dennis Lillee came along more than four decades later. Outside the Tests there was a remarkable performance against Yorkshire. A team containing eight England players, and two more who undoubtedly would not have been out of place in Test cricket, got to 59 without loss before, as second change, Grimmett was brought into the attack. They then subsided to 155, all ten to Grimmett for just 37. In each of the next two home series Grimmett carried on in similar vein with 33 wickets in each. Australia’s opponents in 1930/31 were the first West Indian tourists to visit them, and the following season against South Africa, visiting for only the second time. On a personal level Grimmett’s Test career had been a constant story of success but, at 41, there was to be a stumble with the arrival of Douglas Jardine’s 1932/33 England side. The Bodyline tactics that Jardine employed did not directly affect Grimmett very much, but after the third Test he was dropped. Mallett puts forward the interesting theory that the decision may have had something to do with the Board suspecting that the famous dressing room leak at Adelaide might have come via Grimmett. He did have good links with the press, but the fact that I have not seen that theory put forward elsewhere strongly suggests that however much his luck might not have been in, and plenty of Shield wickets notwithstanding, that five wickets at 65 in three Tests was the real and entirely understandable reason for the selectors looking elsewhere. There were those, and perhaps Grimmett himself, who feared that losing his place in 1932/33 coupled with the emergence of O’Reilly would spell the end of a successful Test career, but he was back in England in 1934 when, as in 1930, he played a major role in the recovery of the Ashes. There were 25 wickets for Grimmett and five-fers in each of the first and last Tests, the two Australian victories. Two years later Grimmett and O’Reilly visited South Africa with a Bradmanless Australia and dominated a 4-0 victory. Grimmett’s 44 wickets for the series leave him third in that particular list, behind Jim Laker’s 46 in the 1956 Ashes and Sydney Barnes’ remarkable 49 in four Tests in South Africa in 1913/14. That said had O’Reilly not been on hand to chip in with 27 who knows how many scalps Grimmett might have ended up with. Richardson’s men left South Africa in March of 1936 and England, led by the Anglo-Australian Gubby Allen, were due to arrive six months later. Bradman was appointed Australian captain for the series, but in the event Grimmett had already played his last Test. Were those two events linked? To be fair to Bradman Grimmett was rising 45, and he didn’t enjoy the best of seasons in 1936/37. But Grimmett had a tendency to speak his mind, and on occasion told the great batsman things he would probably rather not have heard, a description of him as a “bloody squib” after showing some disquiet at the pace of Ernie McCormick being an example. Grimmett was also of course a great friend of O’Reilly, the ultimate agnostic where Bradman was concerned, and for those who ascribe part of that difference of opinion to sectarianism Grimmett was, like O’Reilly, a Roman Catholic. The two spinners picked for the first Test were O’Reilly, undroppable on any interpretation of prevailing circumstances, and Grimmett’s fellow South Australian and leg breaker Frank Ward. Ward was also a late bloomer, pushing 30 before making his bow in the First Class game the previous season. England unexpectedly won the first Test, but Ward took eight wickets, so it was as you were for the second Test, again won by Allen’s men. The selectors decided on a third spinner for the third Test and at 28 “Chuck” Fleetwood-Smith was the coming man, so he was selected and Ward, still with credit from the first Test, was retained. Australia won all three of the remaining Tests and there was no way back for Grimmett. The disappointment of 36/37 behind him Grimmett still harboured dreams of a fourth trip to England in 1938. In the domestic season prior to the selection of the party he took fewer wickets than Ward or Fleetwood-Smith, but paid less for them, so backing his experience over Ward’s relative youth seemed sensible, certainly to him. He was bitterly disappointed when he was left at home, and always held Bradman responsible. As the series turned out his omission was a mistake. Ward played just once in the Tests, and had figures of 0-142. As fierce a critic of the decision as anyone was O’Reilly – How could the selectors have been so stupid? was his comment in his 1985 autobiography. Australia held onto the Ashes by virtue of a 1-1 draw, but England won by an innings and 579 at the Oval to square the series, and Len Hutton took away Bradman’s record with his 364 in England’s innings. Had Grimmett played he might well have stopped the young Yorkshireman getting anywhere near the record, and even if he hadn’t Bradman would surely not have been so desperate as to have to bowl himself and suffer the injury that took him out of the game and robbed him of two opportunities to bat on a pitch that the Oval groundsman “Bosser” Martin had designed to last “forever” in what was to prove the last timeless Test ever played in England. Grimmett played on in 1938/39 and took 27 wickets at 20.85 in five Shield matches. The following season he played nine times, and snared as many as 73 victims at 22.65 with four ten wicket hauls. That season marked the end of the Shield for the duration of the War but, unlike in England, the First Class game was not immediately suspended. Grimmett was 49 during the 1940/41 season but the five “friendly” First Class games he played in brought him 25 more wickets at 26.72 and, had the Japanese attack on Pearl Harbour not prompted the Australian Government to direct its Board to follow the decision made in England and wind up all First Class cricket, he might well have gone on adding to his tally of scalps into his second half century. So Grimmett retired with a career haul of 1,424 in 248 matches. Average wickets per match is not one of the better measures of the quality of a bowler, but is still an interesting statistic. Across his First Class career Grimmett’s figure is 5.74. It is a remarkable one by any standards. Interestingly it is the merest fraction better than that of O’Reilly, but the other giants of the 20th century cannot better Grimmett. Barnes’ figure is 5.40, and the great modern lone wolf, Sir Richard Hadlee, trails in Grimmett’s wake back at 4.35. His playing career over Grimmett earned his living from coaching and writing. There were three books of instruction, two whilst he was still playing, but sadly no autobiography. He was a fine golfer and played the game regularly. He was a non-smoker and, through his playing career at least, almost a teetotaller. Against that background longevity was almost a given for Grimmett and he lived in to his 89th year, passing away peacefully. His obituary for Wisden was, fittingly, penned by O’Reilly – they always were great friends and partners in devastation, and the Tiger concluded his tribute with the observation, with Grum* at the other end, prepared to pick me up and dust me down, I feared no batsman. Our association must have been one of cricket’s greatest success stories of the twentieth century. * Grimmett had an array of nicknames. When O’Reilly first saw him in 1919 playing in a grade match his name was misspelt “Grummett” on the makeshift scoreboard, and for the Tiger he was always Grum after that. His balding pate and sharp features led to some referring to him as “The Gnome”. The commonest during his playing career was “The Fox”, on account of his universally acknowledged wily nature, and of course “The Tiger and the Fox” was a splendid couplet. Finally there was “Scarlet”, as a result of Victorian manager Matt Ellis once likening him to the Scarlet Pimpernel. Grimmett certainly had a very high wickets-per-match figure – for comparison. the only bowlers in the overarm era to take more wickets with a higher ratio are Freeman (6.38), Lohmann (6.28), Richardson (5.88) and Mold (5.83), with only Blythe, Dennett, Wass, Verity, Parker, Goddard and Shaw also over 5.00. (Muralitharan had a higher ratio (5.92) but took slightly fewer wickets (1374)). Incidentally, Grimmett also bowled the most balls per match (295) of any bowler with so many wickets.